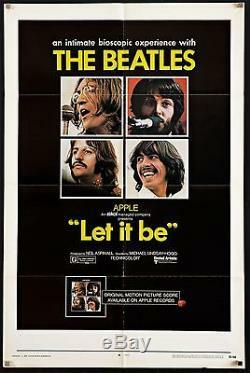 1 Sheet poster for the 1970 Beatles rock documentary "Let It Be", starring the Fab Four: John Lennon, Paul McCartney, Ringo Starr, George Harrison. Poster measures 27x41 inches and the condition is fine/very fine: poster comes folded as issued with some mild fold wear, tiny cross-fold separation and some very minor wear along the bottom border. Please see the attached photo. Please note that the magnets in the corners are used during the photographic process and are not pushpins or elements of the design. PLEASE SEE OUR OTHER AUCTIONS AND STORE ITEMS FOR COOL MOVIE POSTERS. It must come back in the same condition as it was sent. FILM/ART has one of the finest collections of original movie posters. The item "LET IT BE 1970 U. S 1 Sheet The Beatles Paul McCartney John Lennon filmartgallery" is in sale since Tuesday, May 26, 2015. This item is in the category "Entertainment Memorabilia\Movie Memorabilia\Posters\Originals-United States\1970-79". The seller is "filmartgallery" and is located in Los Angeles, California. This item can be shipped worldwide.